I am living in a place where it is sixty degrees one day and thirty the next, so I guess I thought that some spring-ish toes would help inspire the weather to be more consistent. 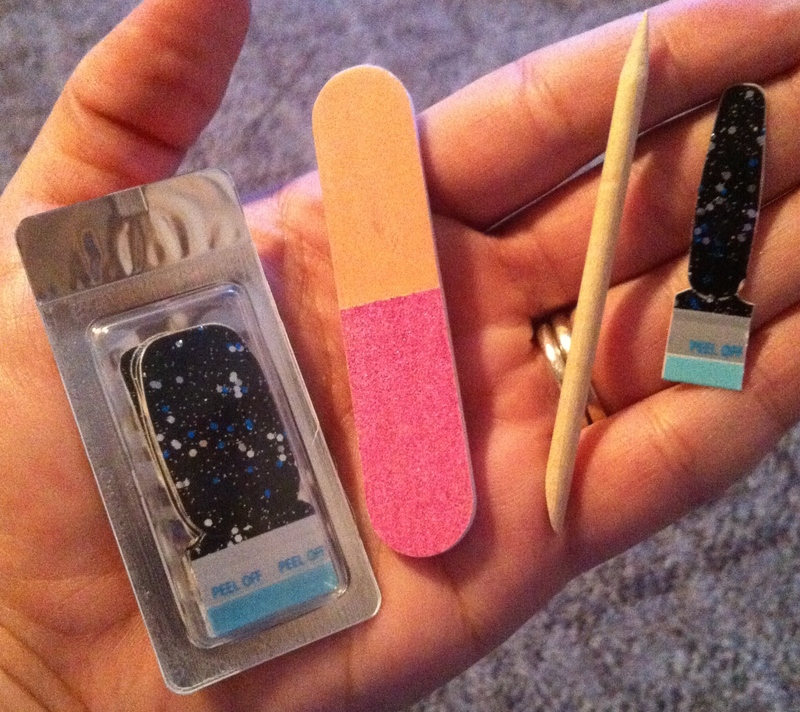 I am not going to say that I love or hate the nail stickers. I am wondering if I should have waited for the pink to be way dry before I applied them. Can you see how they are up on the edges a bit? I want to give them a couple more tries because they peeled off of the sheet easily and are cute. So far, after a few days of wear, they are still on there, just have those edges that I would rather be flat. 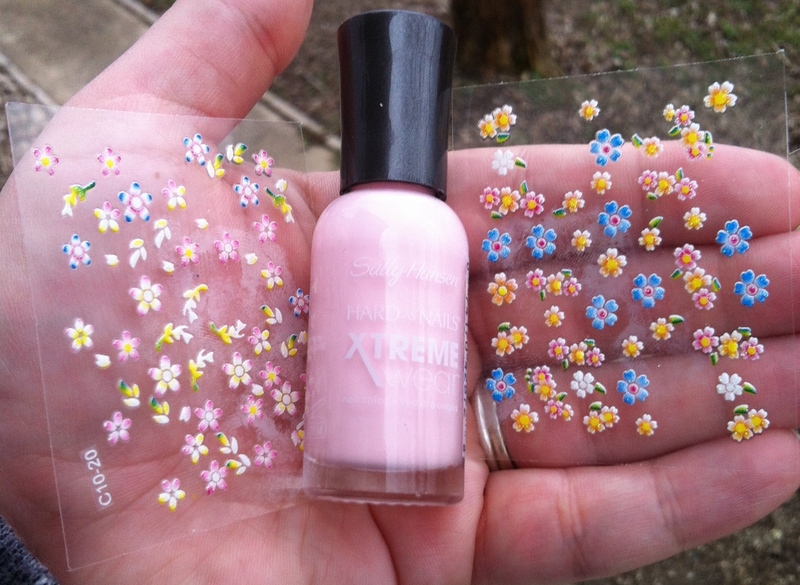 Overall, I really like the pink and still see potential in the stickers, so will give them another go some other time. Here’s to hoping Spring weather comes in time for Easter! So, I made a very real attempt at something cute. 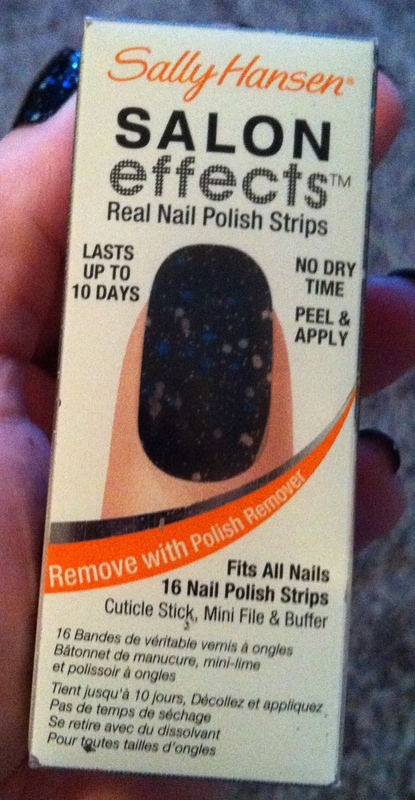 I was using this dark gray, metallic polish. 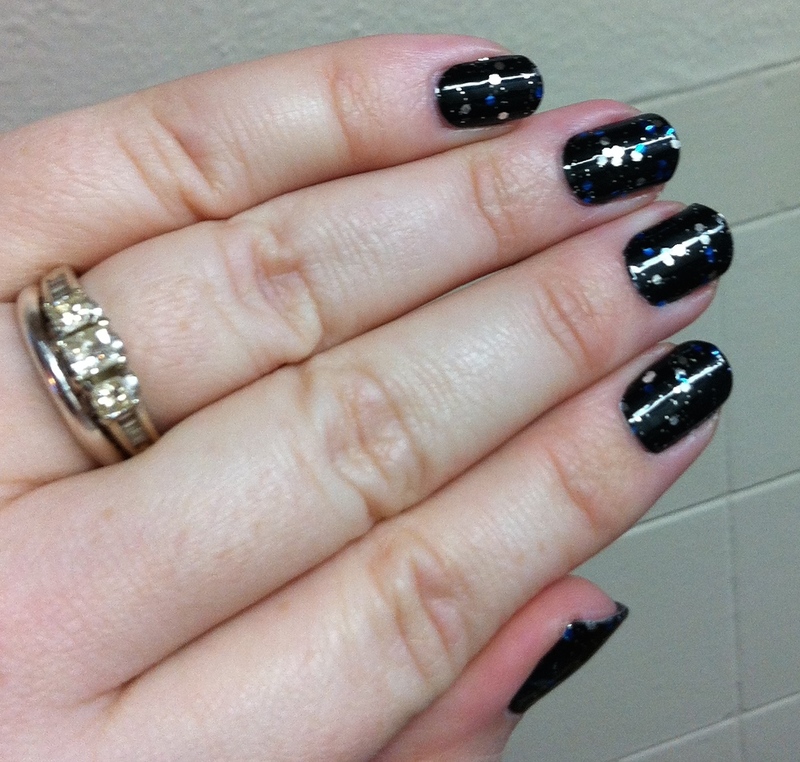 I had nail stickers chosen, thinking that those would be a quick, cute accent. I was wrong in so many ways! The nail stickers ripped, the polish looked streaky, and when I thought it was dry I touched stuff, and realized I was wrong on that too. UGH! After removing the epic fail, I had no more patience to try again. I reached for something I forgot I had stashed away. (I don’t know if it is considered cheating in the nail polish world, but for me, it was a way to have cute nails without the stress.) 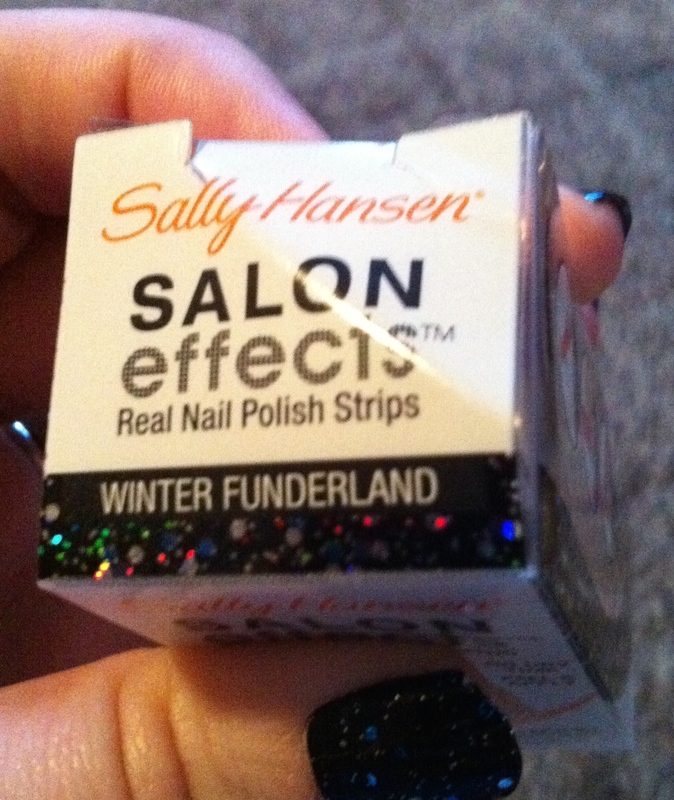 I used Sally Hansen Salon Effects Nail Polish Strips. Now that I have dug them out, I am wondering why I forgot about them!!!! 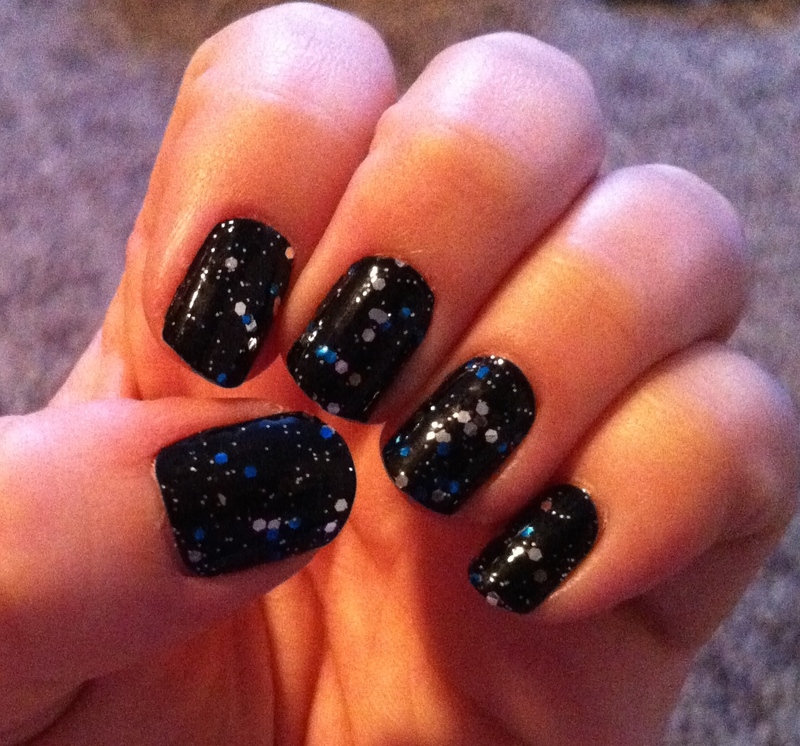 I chose Winter Funderland, which is a black base that has silver and blue glitter in different sizes. Inside of the package you get everything you need to put them on. The instructions are freakishly simple. Just make sure your nails are clean. I do put on a base coat, but you don’t have to. And, I did not use a top coat. 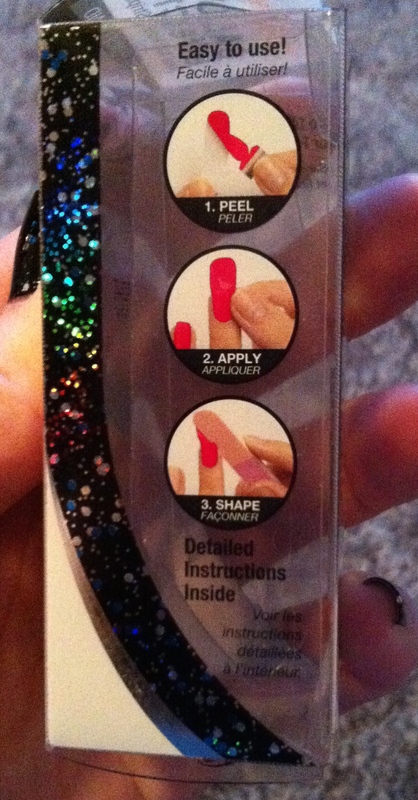 I also like how the box has the “polish” color on it so you can see what you are getting into. Now, check out this shine! This is without any top coat at all! These wear like cast iron. Without a top coat, at the end of the week there was just minimal tip wear. Ladies, no joke…if you have these stashed somewhere, get them back out. No dry time, no worrying about cleanup or having steady enough hands to place little jewels, just gorgeous in no time, and then walk out the door!!! I do not think these are glaringly stickers. 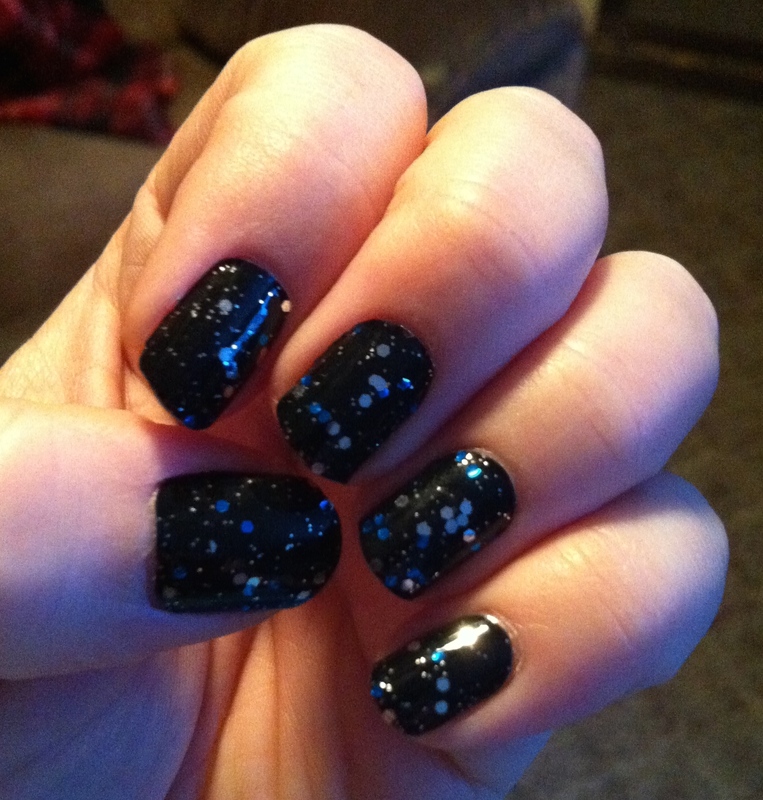 I could paint my nails black with glitter. Now, once you get into some patterns, that may be a different story. Also, there are so many size choices, and the excess is so easily trimmed, that there aren’t awkward gaps on the sides of my nails, like lots of other stickers leave you with. Sorry for the dark pics, but the shine was so great that it was hard to get a shot to see what the actual polish looked like. Tell me what you think about these! Are they cheating? Are they legit? Do I care when I look that good in no time? 🙂 Thanks for reading!